Remy Ma fired some major shots at Nicki Minaj this weekend after unleashing her Black Barbie-aimed diss track 'ShETHER'. The seven minute roast sees the American rapper call out Minaj by name, throwing huge insults at her long-time rival including claims of implant surgery, ghostwriting, and relationship rumours surrounding Meek Mill, Drake, Lil Wayne and more. The name 'ShETHER' takes inspiration from Nas's legendary 'Ether' diss track aimed at Jay Z, highlighting the comparisons Nicki Minaj has previously made between herself and Hov. In response, Nicki Minaj posted a video to her Instagram account, in which Beyonce can be heard hailing the 'Anaconda' star as 'the rap queen'. 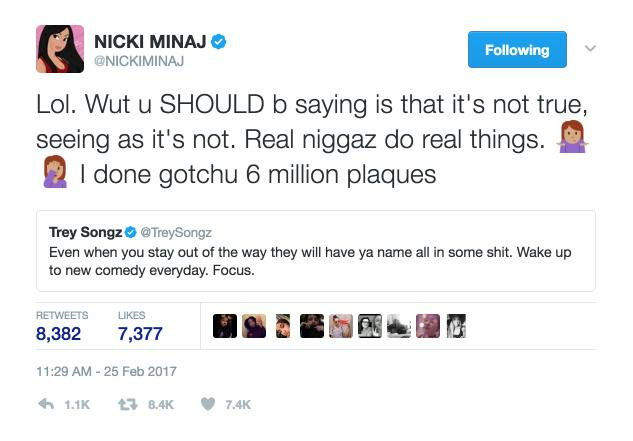 Nicki also took to Twitter to trade words with her 'Bottles Up' collaborator Trey Songz after his name was dropped in one particularly slanderous 'ShETHER' lyric. "Mentioning guns, you P***y Galore, James Bond / Only time you touch a trigga is when you f**ked Trey Songz," spat Remy Ma. 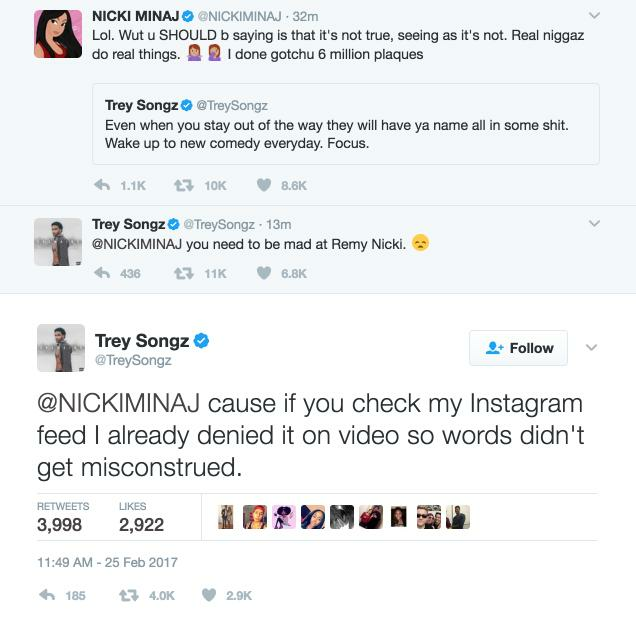 Nicki argued that Trey failed to do his part in dismissing the claims, leading him to defend himself and promoting Minaj to delete her tweet. Naturally, the rest of Twitter erupted soon after the song was initially released. Remy Ma disses @NICKIMINAJ one good time & y'all act like that's really about to end Nicki career. Remy stats will never match w/ Nicki's. If lil Kim couldn't end @NICKIMINAJ what y'all think inmate 74690 can? Tell me how Nicki Minaj gonna end Remy Ma's none existing career??? How is she gonna kill a dead person?? Beyoncé: stay out of it blue aunty @NICKIMINAJ got it. ...whilst hoards of tweets rolled in contrast, arguing that Remy's diss had 'ended' Nicki's career. Just want to say I've been waiting for someone to come through & put Nicki Minaj in her place. Remy Ma go head booo.